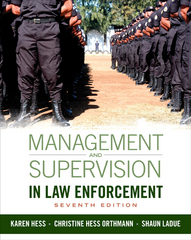 Management and Supervision in Law Enforcement 7 Edition MANAGEMENT AND SUPERVISION IN LAW ENFORCEMENT is a practical and straightforward book that focuses on law enforcement managers and supervisors, their jobs, and the complicated interrelationships between members of the law enforcement team and the communities they serve. The seventh edition begins with a general overview of the policing profession to provide context for later discussions of the role of managers within the field. Readers will learn about post-9/11 policing, research on the effects of 9/11, and the latest on data-driven policing, intelligence-led policing, evidence-based policing, and predictive policing. A new "Ethical Dilemma" boxed feature challenges readers to think critically about the moral issues faced by supervisors every day. This comprehensive overview of the responsibilities of law enforcement leaders, covering relevant topics ranging from the newest principles in policing to the exciting technological aids changing the face of law enforcement today, prepares readers to become tomorrow's leaders.